After rolling out the iOS 4 update on Monday, Apple followed up with one of the things it had touted as a key feature of the new OS. 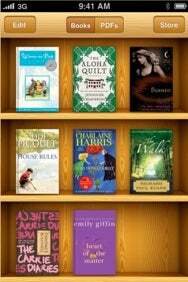 The company’s e-book reading app, iBooks, has been updated to run on the iPhone and iPod touch. Released as a 1.1 update, iBooks is now a universal app for the iPhone, iPod touch, and iPad; it debuted on the latter device back in April. This latest version brings a number of new features to the reading experience, including bookmarks, the ability to highlight passages, and note-taking capabilities. All of these annotations can stay in sync across your iPhone, iPad, and iPod touch, too. iBooks 1.1 also lets you choose between a sepia or white page background, and Georgia is available as a new font. You can choose between left or fully justified text layouts; you also have the ability to increase the font size even larger than before. Just like it did with the iPad, Apple has made Winnie the Pooh available as a free download to iPhone users who install iBooks. iBooks requires iPhone OS 3.2 or greater, and it is available now for free in the App Store.